Before the late Nineteenth Century, schooling was not compulsory and rarely free. The wealthy could send their children to schools providing a high-quality, classical education or employ private tutors. For the majority, the education provision which did exist varied in both quality and quantity. From the late 1700s onwards, Sunday schools were often the only source of education for most children. The Bible was used as a textbook to teach reading and writing. Furthermore, individuals or institutions with a belief in education for the masses started to establish voluntary schools which operated during the week. They were called voluntary schools because they were financed by voluntary (i.e. charitable) subscriptions. In 1812, the National Society for the Education of the Poor in the Principles of the Established Church was founded and began taking over schools previously set up by religious charities. The local branch was established in the same year and was known as the Norfolk and Norwich Society. It provided and maintained voluntary schools (which had religious affiliation to the Church of England) throughout the area and distributed central government grants to local schools until the Elementary Education Act of 1870 came into force. 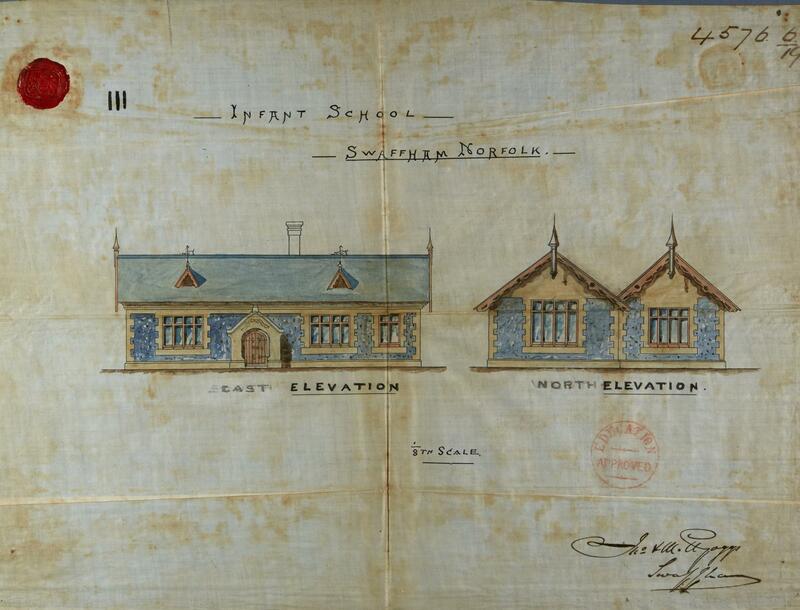 These plans of Scottow School, 1859, were approved. Click for larger version. In the Nineteenth Century, people wishing to establish a voluntary school could submit architectural drawings to the Education Department of central government, in the hope of attracting grants. Many were successful in attracting funding, but others failed to meet with approval. If a submission failed, then no grant was made and no buildings in the form submitted would be built. The Norfolk Record Office holds plans for about 140 proposed schools. The plans are from the 1840s to the 1870s for about 140 city and county parishes. This collection includes plans, elevations, sections and sketches of new or additional school building schemes. They are often accompanied by additional documents including sketched details of fixtures and fittings and notes of costings. This is the 1871 school building grant plan for Swaffham Infants National School, which was approved. 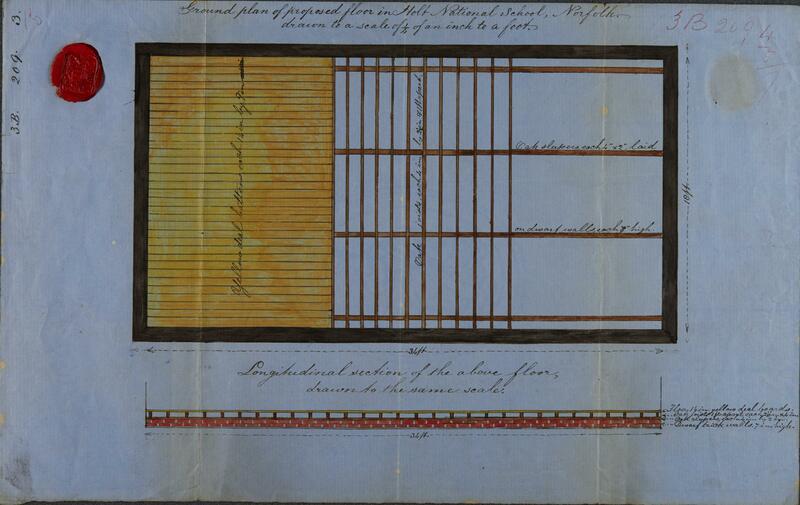 The following two images are of the school building grant plans (1841) for Holt National School. Plan showing location of boys’ and girls’ playgrounds, spaces for hats, coats and coal. Click for larger version. 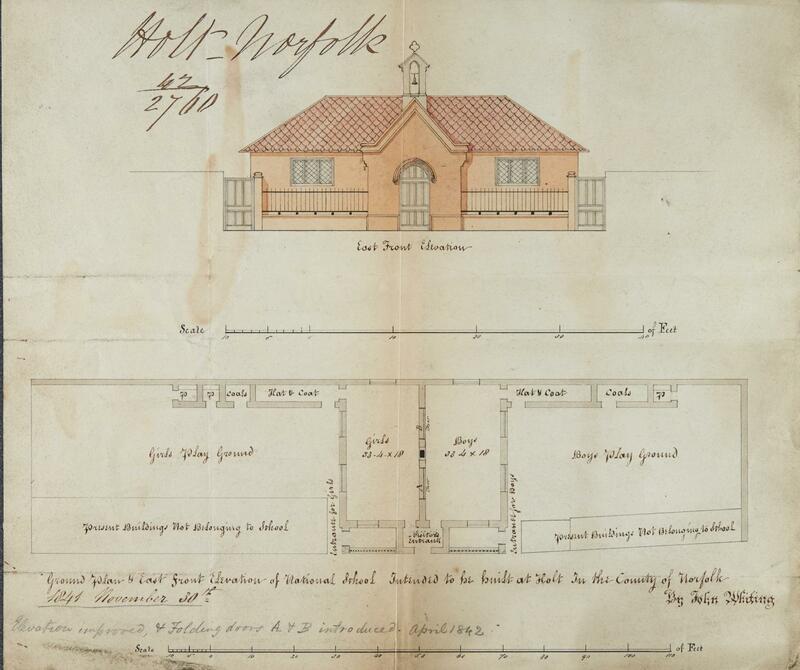 This 1845 plan is to convert the Theatre into a National School in North Walsham. 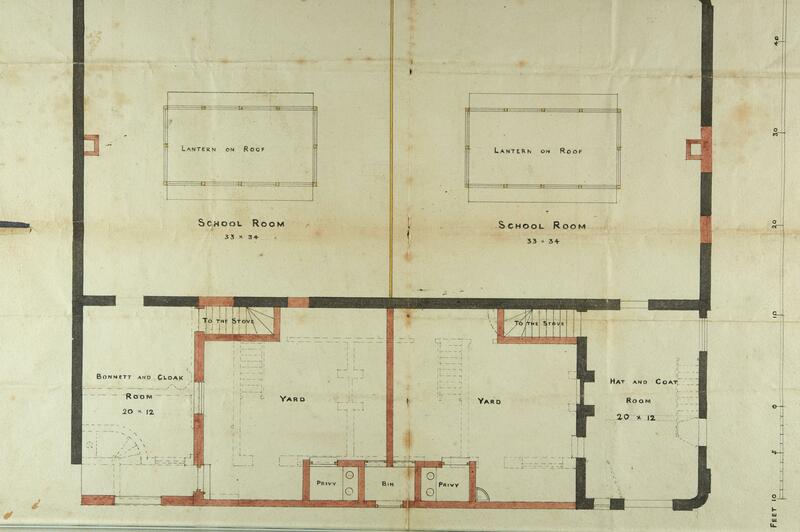 Plan showing location and use of rooms and facilities, including a ‘bonnett and cloak room’ and a ‘hat and coat room.’ Click for larger version. The catalogue entry for all the school building grants starts with p/bg. Try typing p/bg into our online catalogue here and you will see the entries. This blog post is inspired by the Norfolk Record Office ‘Building An Education’ exhibition from 2011. An online version of the exhibition can be viewed on our website here. A project to survey every surviving rural Norfolk school built before 1950 was initiated by the Norfolk Historic Buildings Group and resulted in this book which was funded by English Heritage and edited by Adam Longcroft and Susannah Wade-Martins from the University of East Anglia’s School of Education and Lifelong Learning. For more information about all kinds of school records that are held at the Norfolk Record Office have a read of this this Information Leaflet. This entry was posted in Snapshots from the Archive and tagged architectural plans, charity, Church of England, education, exhibition, funding, grants, Holt, illustration, North Walsham, school, Swaffham, UEA. Bookmark the permalink.